Although my journey with clay began many years ago at night classes in the UK and later, whilst living in America, at the Art League in Alexandria, Virginia, my commitment to clay was intensified in September 2008 when I was awarded the Lorton Arts Foundation 'Emerging Ceramic Artist Grant for 08/09' at the Workhouse Arts Centre in Virginia, USA. The year was spent working in the studio within the ceramics department, furthering my technical skills in all aspects of ceramics and practicing my craft. I produced work for sale, from the dedicated ceramics gallery, throughout the year, and culimnated with a solo exhibition which was a sell-out success. On returning to the UK in 2009, I set about constructing a studio in my garden in Surrey. 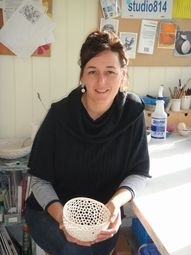 My work is made from porcelain clay and each piece is hand thrown on the potters’ wheel. I then either decorate the piece with one a simple, vibrant glazes chosen to contrast with the creamy unglazed exterior. Alternatively I will alter the piece with the addition of perforations, creating visually light forms that cast delightful shadows on the surface on which they are displayed. The outer surface of my ceramics is often left unglazed allowing the user to connect with the raw, egg shell like, quality of the porcelain. My aim is to create ceramics that are an elegant mix of functionality and form that have tactile yet ethereal qualities.